Sitting supremely atop the luxury-SUV pinnacle is the 2016 Land Rover Range Rover. The SUV concept was started by Land Rover and Jeep, and the British nameplate remains the standard for world-conquering capabilities and unbeatable image. From a New Guinea jungle to a Connecticut dinner party, respect for and recognition of Range Rover is universal. 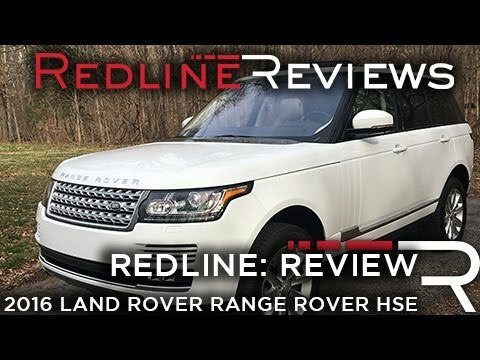 Range Rover a great vehicle, but still has some room for improvement. Vehicle is great to drive. Great experience and great features. Wish it had remote start. It's very surprising it doesn't. Have had issues with the tire pressure system having faults and throwing errors and currently the replacement part is on backorder with no timeline for replacement. Overall I'm a huge fan of Range Rover but have had some minor maintenance issues. My vehicle is great and I am proud to drive it. The vehicle is handsome classic well built reliable dependable comfortable enjoyable a head turned traditional styling classy leather interior beautiful bronze color with beige Accents and wood trims has navigation tools that have helped eliminate unnecessary detours or construction zones that allow me to find the best route to my destination. Handsome and brand worthy and trustworthy. Handsome reliable dependable good looking proud to have and drive and it is a head turner for others who drive vehicles. Comfortable and provides a good sturdy drive and has many comfortable components that make driving pleasurable and it will be enjoyable for many years. Jaguar Land Rover North America, LLC (Land Rover) is recalling certain 2016 Land Rover Range Rover and Range Rover Sport vehicles. The passenger frontal air bag inflator initiator may fail to ignite during a crash. Land Rover will notify owners, and dealers will replace the front passenger air bag, free of charge. The recall began May 1, 2017. Owners may contact Land Rover customer service at 1-800-637-6837. Land Rover's number for this recall is N026. Jaguar Land Rover North America, LLC (Land Rover) is recalling certain 2016 Land Rover Range Rover and Range Rover Sport vehicles and 2017 Range Rover Evoque vehicles. The affected vehicles have a front passenger air bag inflator initiator that may fail to ignite during a crash, preventing the air bag from deploying. Land Rover will notify owners, and dealers will replace the front passenger air bag, free of charge. The recall is expected to begin February 20, 2017. Owners may contact Land Rover customer service at 1-800-637-6837. Land Rover's number for this recall is P094.